The turmeric plant, a member of the ginger family which originates in Southeast Asia, is something you might be familiar with having in your curry. It’s the plant that the orange / yellow spice curcumin comes from. But aside from being a tasty food flavouring, many believe that turmeric – or perhaps more accurately its main active ingredient curcumin – also has health benefits for people and for dogs. But what’s the evidence behind this spice? Is it really more than just a food flavouring? Turmeric is widely used in alternative medicine circles where it’s believed to have anti-inflammatory and anti-microbial properties, boost the immune system and act as an anti-oxidant. It’s because of this wide array of reported health benefits that a lot of dog owners include turmeric in their dog’s daily diet. There are a number of ways in which you can do this. You can make a ‘turmeric paste’ that can be poured onto their food or include it in any home-made meals you prepare. Turmeric has poor absorption but studies have shown an increase in bioavailability when given with piperine. Piperine is a part of the outer shell of peppercorn. You can buy supplements that contain both turmeric and piperine or you can simply add a pinch of freshly ground pepper. As well as being considered a way to treat – and potentially even prevent – this wide variety of ailments, turmeric is also thought to help cure more serious illness including diabetes, arthritis and Alzheimer’s. In particular, many people believe that the spice can help prevent and treat cancer. 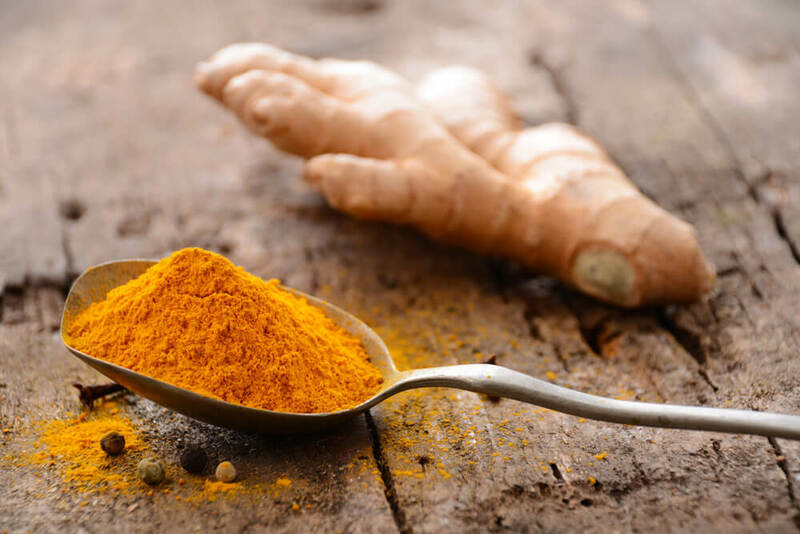 While there are a lot of people who regularly feed their dog turmeric, there is no scientific evidence to show that the plant – or the curcumin it produces – can help with any of the more minor ailments listed above. There is also no scientific evidence to show that it can help prevent or treat Alzheimer’s, diabetes, arthritis or cancer. There is however research being carried out looking into whether turmeric or curcumin does have any health benefits and if it could in fact be used to treat some diseases. Excitingly, some of them are showing promising results. For example some studies have shown that in the lab, curcumin can kill breast, stomach, bowel and skin cancer cells and prevent more from growing. Others have shown that it can stop breast cancer cells spreading to other parts of the body. Early research also suggests that turmeric can reduce the formation of amyloid plaques that are associated with Alzheimer’s and that it can reduce inflammation (i.e. act as an anti-inflammatory). But it’s important to remember that the vast majority of this research has been carried out using cells in a dish in a lab. This means that more research and clinical trials need to be carried out before we can know if turmeric really can help treat any of these diseases in dogs. While we don’t know for sure if including turmeric in your dog’s diet will benefit their health, we do know that for the most part, it isn’t likely to cause them any real problems or serious side effects. However we do know that if given in too high doses, turmeric can cause vomiting, diarrhoea and liver problems. It can also cause indigestion, flatulence and yellowing of the stool. Turmeric should be used with extreme caution in dogs undergoing chemotherapy as it has been shown to interfere with how these drugs work and to reduce their efficacy. Care should also be taken when including turmeric in the diet of dogs with underlying medical conditions. As with any alternative medicine or herbal supplement, it’s important to speak to your vet if you are thinking of including turmeric in your dog’s diet. While it may not necessarily cause any side effects, there’s still a chance it might cause harm, so it’s worth having the conversation.